It has taken me quite awhile to write this post and I’ve wondered over the last few months exactly what I was going to say and how I was going to say it. 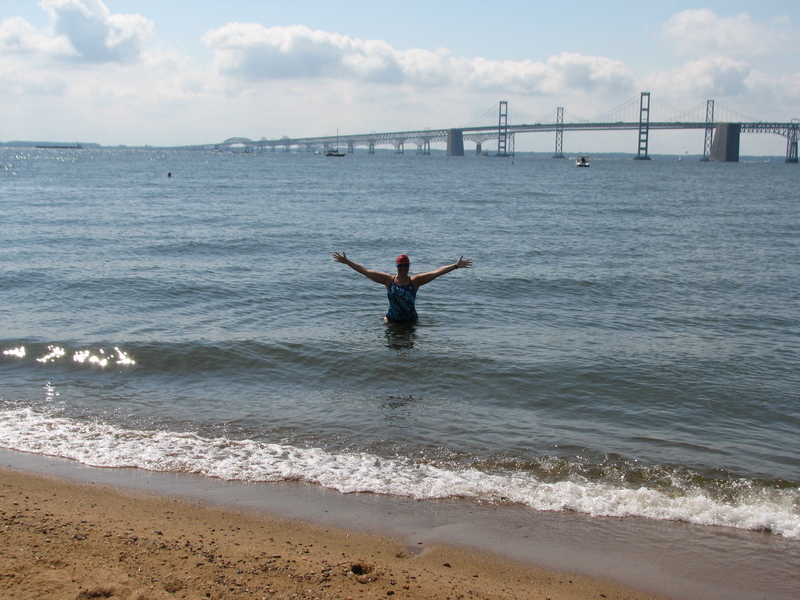 Tomorrow marks my 13th Great Chesapeake Bay Swim. It is now officially the start of the 2015 open water season for me. It is time for a post. As many of you know, late last November, I broke my left wrist in four places as well as the scaphoid bone in my left hand. 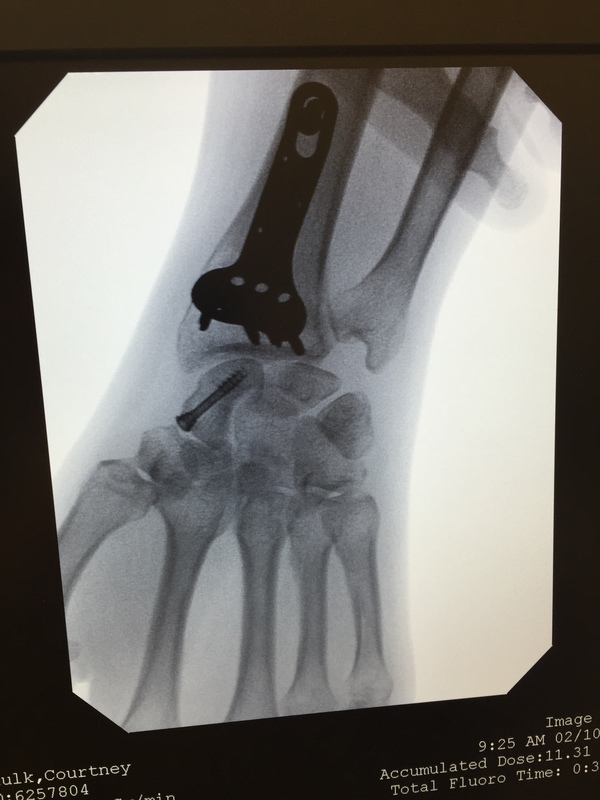 The break was bad and I had surgery two days later to have a metal plate and screws put into my wrist and a pin put into my scaphoid. And, so began my journey of recovery. I spent many painful weeks and months after the surgery wondering how this injury was going to impact my swimming. And, quite frankly, it consumed me at times. The pain from the injury itself was nothing compared to my fear over how such a severe injury, to my arm no less, was going to impact my swimming. But, there was nothing to do but work on my wrist along with my amazing therapist Carrie and wait and see. I got back in the water slowly and, in the beginning of March I tried to swim some while we were on vacation in Jamaica. But, something didn’t feel right – in my body or my head – and I couldn’t quite put my finger on it. When I got back to pt, we realized that not only was my wrist still recovering, but my shoulder and my scapula had essentially locked up from having been immobilized for so long. We began working on that and I started to feel a little better in the water. But my stamina had atrophied along with my body. On many days I felt I was taking one step forward and two steps back. During the last month or so, my body has started to come around, but, again, something didn’t feel quite right. This week, my dear friend Anna Maria sent me a message wishing me luck this weekend in the Bay Swim. And, what she said helped me put my finger on exactly what had been nagging at me. She said that she hoped my arm would get the business done this weekend – because she knew my head would. And, there it was – Anna Maria elegantly summed up in one sentence what I had been trying to figure out for months. I read her message several times and realized what I had been feeling was a lack of confidence in my body – not in my head. Until Anna Maria’s message, I hadn’t really been able to separate the two things. She reminded me that my head didn’t break last November – my wrist did. Of course, when your body lets you down it does cause you to feel fragile in both body and spirit. But, I knew Anna Maria was right – my body may let me down this weekend (hopefully not) – but my head certainly won’t. I’ve swum across the Chesapeake 12 times before and it is like an old shoe. It is the perfect swim for me to tackle as I come out of this journey of recovery. temperature being only in the low 60s. But mostly I remember the dark places I found myself in along the way and how my head got me through that swim. When I reached the other side – that was why I was proud of my accomplishment. My head got me through and my body had just been along for the ride. That is what keeps me coming back. Despite my wrist, shoulder, scapula and stamina still not being quite right, I will stand on the beach at Sandy Point State Park tomorrow and look across to the other side of the Chesapeake Bay and know that, whatever happens along the way, my head will get me across. My body may let me down – and I hope it doesn’t – but, there is no way I will stop swimming because my head lets me down. I have spent many, many years training my head in addition to my body. My head hasn’t atrophied or broken. It is still as stubborn and motivated as ever. So, thanks Anna Maria for helping me find my way back to me. I’ll let you know how it goes after I get to the other side. This entry was posted in Great Chesapeake Bay Swim. Bookmark the permalink. You are an extremely impressive lady and athlete, Courtney! Wishing you a good crossing. What an insightful post, Courtney. It’s such a complicated journey to come back from injury – always requiring way more mental (and physical) reserves than you thought you possessed. You are a step ahead of the curve in that your head is in the right place – and with that, your body will follow. Here’s hoping for a great opening swim for you! a great way to get back in the water! Thanks Mo!!! Hope you’ve had a good journey down the Hudson this week. Miss you!